Rehoboth Bay watershed makes up one of three of Delaware's Inland Bays. The Inland Bays consist of three interconnected bodies of water - Rehoboth Bay, Indian River Bay, and Little Assawoman Bay - all located in southeastern Sussex County that are further divided into subwatersheds. 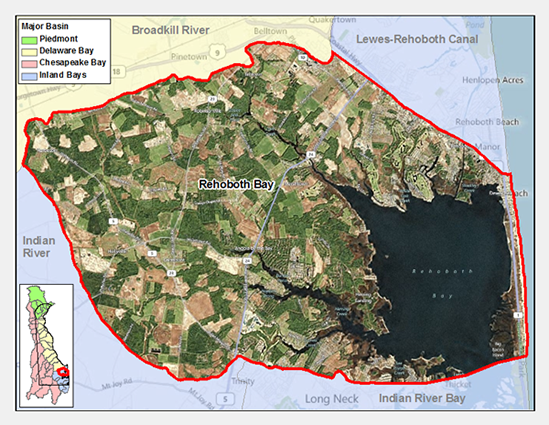 The subwatersheds of the Rehoboth Bay consists of the Lewes-Rehoboth Canal Watershed and the Rehoboth Bay Watershed. The Rehoboth Bay watershed is made up of 45,000 drainage acres, a total stream length of 51.3 miles and a mainstem length of 15 miles. 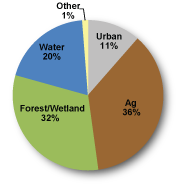 There are nutrient and bacteria TMDLs for the Rehoboth Bay Watershed which requires a 40% reduction in phosphorus and nitrogen, 40% reduction in freshwater nonpoint bacteria, 23% reduction in marine nonpoint bacteria, and a cap on point source bacteria at a geometric mean concentration level of 35 CFU enterococcus/100mL until all point sources are eliminated as required in the 1998 Inland Bays Nutrient TMDL Regulation. The Rehoboth Bay Watershed has five sites listed in the Site Investigation and Restoration Section database. Three sites are state-fund lead (HSCA), one is listed as Formerly Used Defense Sites (FUDS) and one site in the Voluntary Cleanup Program (VCP). If you would like to view reports for any of the sites in the SIRS program please follow the link the DNREC Environmental Navigator to search by map for the Rehoboth Bay Watershed. Along the Chapel and Hopkins Prong, the soils include predominantly Evesboro-Rumford association, described as "Excessively drained and somewhat excessively drained soils that have a rapidly permeable subsoil of sand to sandy loam." Love Creek sub-basin and north of chapel Branch, soils include predominantly Sassafras-Fallsington association, with a moderately permeable subsoil of sandy loam to sandy clam loam. There is tidal marsh along the headwaters. The region is level to gently sloping, with one site reaching 53 feet above sea level. Significant wind and water erosion areas have been identified by Sussex County Conservation District.